NASA photo of the Río de la Plata looking from northwest to southeast. Buenos Aires is visible on the right side near the Paraná River delta. River sediments turn the water brown to the vicinity of Montevideo, visible on the left coast. Name oreegin: Spainyie, "river o siller"
Cairt o the La Plata Basin, shawin the Río de la Plata at the mooths o the Paraná an Uruguay rivers, near Buenos Aires. Cairt o the Río de la Plata, shawin ceeties in Argentinae an Uruguay. 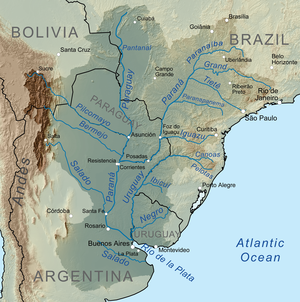 The Río de la Plata (Spaingie pronunciation: [ˈri.o ðe la ˈplata], River of Silver) is the estuary formed bi the confluence o the Uruguay an the Paraná rivers. ↑ 3.0 3.1 "Río de la Plata". Encyclopædia Britannica. Retrieved 11 August 2010. ↑ Fossati, Monica; Ismael Piedra-Cueva. "Salinity Simulations of the Rio de la Plata" (PDF). International Conference on Estuaries and Coasts. Retrieved 11 August 2010. This page wis last eeditit on 3 Mairch 2018, at 23:45.